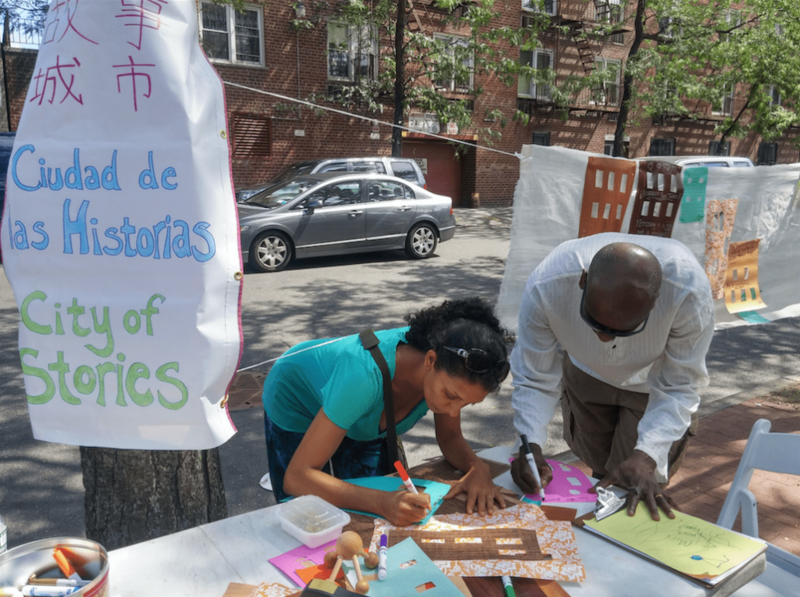 City of Stories: Jackson Heights invites passerby to write down memories, stories, and wishes for Jackson Heights and Queens, and hang their stories to create a colorful city out of paper buildings. Manuel de Dios Unanue Triangle is a block and a half from the 7 train station at 82nd St – Jackson Heights. City of Stories takes place from 12:00-4:00pm as one of many participatory activities in “A Living Room on Roosevelt / Una Sala en La Roosevelt“, happening from 12:00-6:00pm. Five Boro Story Project and Priscilla Stadler are collaborating with artist Ro Garrido’s “A Living Room on Roosevelt / Una Sala en La Roosevelt” to present City of Stories: Jackson Heights. 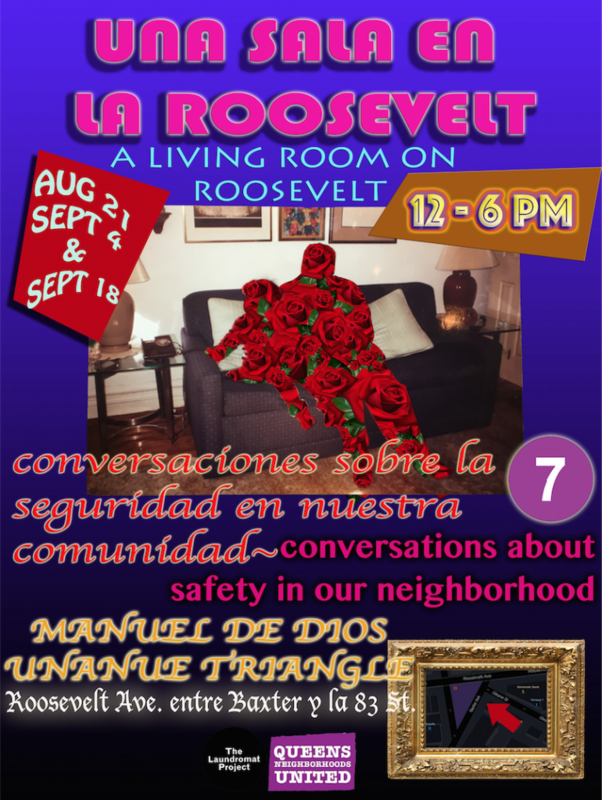 “A Living Room on Roosevelt / Una Sala en La Roosevelt” brings an interactive living room into the commercial corridor of Roosevelt Avenue with the purpose of creating an intentional space for community members to have conversations, and share knowledge and history related to issues of community safety in Jackson Heights. In partnership with Queens Neighborhoods United (QNU), a local grassroots group that works directly on issues of gentrification and displacement, conversations are tied to current issues in the form of open dialogues on the street or facilitated group conversations. The living room also serves as a growing visual memory archive of personal and collective immigrant narratives in Jackson Heights. City of Stories is a participatory installation that creates contemplative, interactive spaces where community members and passerby can write memories, stories, and wishes for their neighborhood. Developing from the intersection of Bridget Bartolini’s Five Boro Story Project and Priscilla Stadler’s Fragile City, City of Stories invites the public to collaboratively create their own art intervention. Participants write down their stories on paper buildings, mirroring the Fragile City buildings, hang them for the installation, and read the stories of others. As the paper buildings amass, they transform public spaces into a colorful city, made up of stories that provide a powerful sense of community members’ experiences, concerns, and visions. View “City of Stories: Jackson Heights” photos HERE.